Just dropping a note here as I know a lot of people have been asking about the new MIO kits, Pullipstyle has posted up two of the new MIO kits up for preorder. For those of you who don’t know MIO or Make It Own kits are blank doll kits you can assemble and customize yourself so the possibilities are endless. The Pale MIO kit and the Tanned MIO kit are slated for a May release here in the US. The other two MIO kits Pale as well as the re-release of the Natural MIO kits should be out roughly a month later. I do not have the new MIO kits on hand, I do however have the dolls that are said to be the same skin tones as the MIO kits so I decided to do a comparison. Pullip Peter Pan versus Cheshire Cat Byul, as a lot of people have asked about how the two compared. EDIT: Two more comparison pictures! 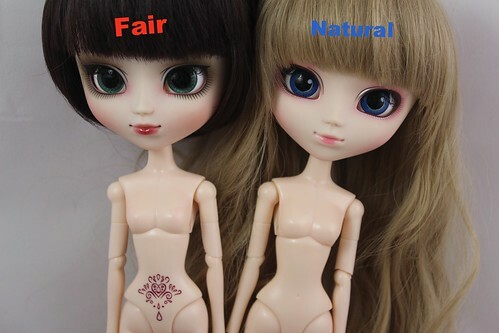 A more direct skin tone comparison of Pullip Kuhn (said to be the same color as the Fair MIO kit) and Pullip Nostalgia Merl (said to the same color as the Natural MIO kit). Skin tone comparison between Pullip Kuhn (said to be the same color as the Fair MIO kit), Pullip Naomi on a white skin obitsu and Pullip Nostalgia Merl (said to the same color as the Natural MIO kit). This entry was posted in byul, Doll, Pullip and tagged make it own, mio, Pullip. Bookmark the permalink. hi 🙂 do you know what obitsu would watch well with the tan mio doll? would fleshtone be too dark or? Hi, I don’t obitsu many of my dolls in fact I think I only have two dolls on fleshtone obitsus and neither has been unpacked yet ^^; This picture isn’t by me but shows the tanned MIO head on a fleshtone obitsu https://www.flickr.com/photos/steffipuschel/13907679419/ .